Creamy, garlicky white sauce is the base of classic spinach artichoke dip turned into a pizza. In a medium saucepan, heat oil and add the garlic and red pepper flakes; cook, stirring constantly, 30 to 60 seconds. Gradually add prepared LeGoût® Cream Soup Base. Bring the mixture to a simmer over medium-low. Stir occasionally for about 5 minutes. Stir in the Parmesan and lemon zest. Meanwhile, add the spinach to a medium saucepan over medium-high heat. Cook and stir until the spinach wilts, about 1 minute. Remove the spinach from the pan and remove all excess liquid, then add to the LeGoût® Cream Soup Base mixture. 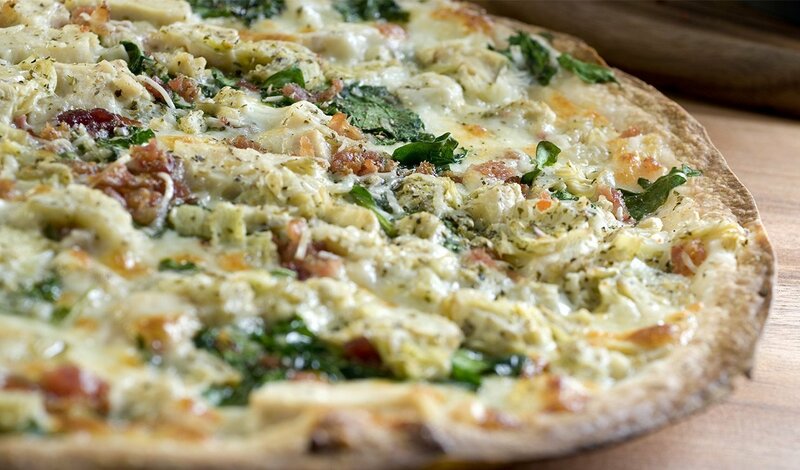 Spread ½ of the spinach sauce over each of the rolled pizza doughs, then top each with half of the mozzarella, artichokes, bacon and oregano. Bake at 425⁰F until the cheese is bubbling and the crust is brown.